The incoming webhook handler focusses on letting third party (external services) post messages in your bot. The bot's incoming webhook handler should be configured in the third party service with the authentication key or API Key. This API key is useful for authenticating the incoming webhook API's from external services. headers Header details from the request made to the server. parameters Parameter details from the request made to the server. body Request body as the type string. user Details of the user who has triggered the handler. Let us consider the Connect Bot as an example. 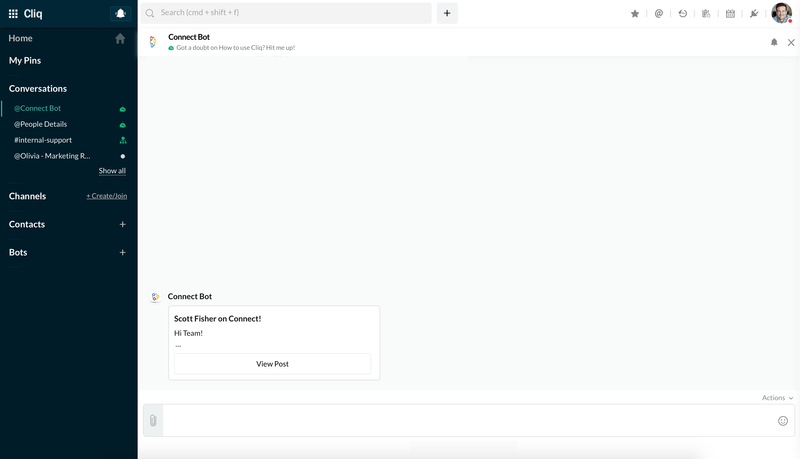 The Connect Bot is configured bring notifications about a new post or announcement made on Zoho Connect. 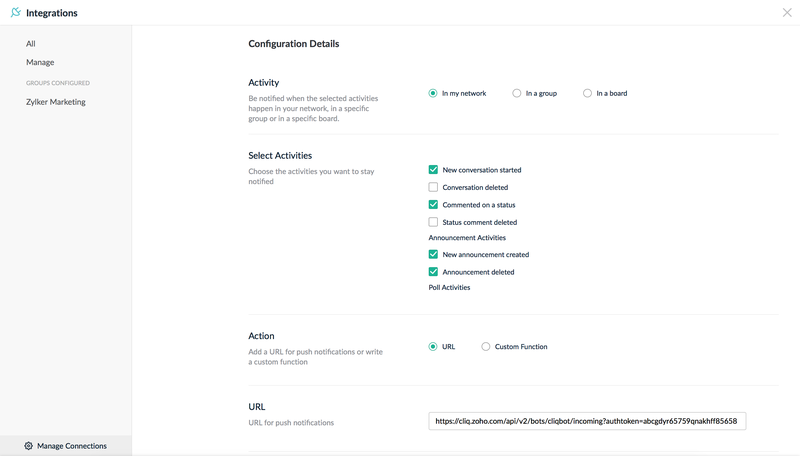 Zoho Connect has an Outgoing Webhooks Module where the bot's webhook URL has to be configured. The webhooks module has a list of activities for which event updates and notifications are offered. You can choose the list of events for which you would like to be notified and proceed to configure the bot webhook URL. In this example, token based authentication method has been used to generate an authtoken. In scenarios where the bot is bundled into an extension, you can pass the extension's ZAPI Key as a value for the authtoken. In Zoho Connect, click on the Integrations icon and select Outgoing Webhooks. Click Configure and select activities for which you would like to receieve updates. Activity - In my network. This means, you'll be notified about any updates in your connect network. Activites - Conversation, Announcement, and Forum Activities. The bot incoming webhook URL is called with the corresponding JSON Object when an activity occurs in Zoho Connect. This JSON will be available either in the headers or body parameter of the incoming webhook handler. Configure the bot response based on this JSON received. 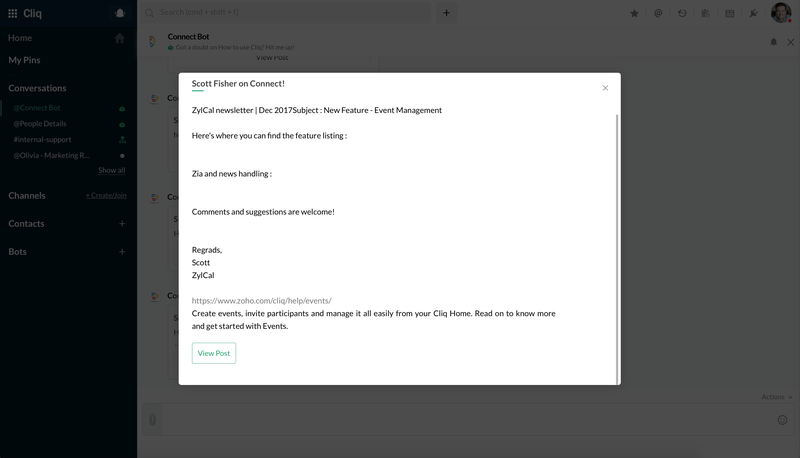 A sample syntax of the Zoho Connect bot's incoming webhook handler is given below. Cliq Bots - Get notifications about any action on an application with the incoming webhook handler!